An innovative colorful, long-wearing commerical carpet. 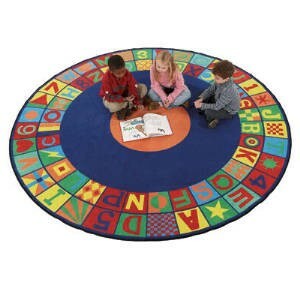 All 26 letters and 10 Numbers are represented on the carpet. These letters and numbers are ideal for teaching letter and number recognition, color recognition, visual discrmination, phonics rules, math facts and more. Floors Teach is made with Denistech technology, Force Five, Stain Shield, and Mircrogard. Includes a teaching manual and learning games.